Having that extra beer or finishing that bottle of wine — because who really wants to save it for tomorrow? — might not be good for you, but it doesn’t mean you have a drinking-dependency problem. It’s easy to exceed healthy drinking guidelines, generally defined as eight drinks a week for women and 15 drinks per week for men. Those seemingly-stingy limits make many people ask a fair question: Does drinking too much make you an alcoholic? No, according to a newly published study by the Centres for Disease Control and Prevention. While hitting the bottle too frequently still has serious health risks, that’s not the same as alcoholism. “Contrary to popular opinion, most people who drink too much are not alcohol dependent or alcoholics,” said Robert Brewer, M.D., M.S.P.H., Alcohol Program Lead at CDC and one of the report’s authors, in a press release. 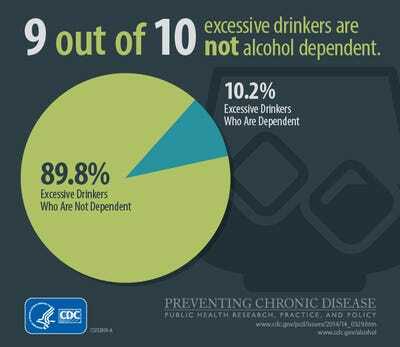 While 30% of Americans go over those healthy guidelines, only 10.2% of those excessive drinkers actually qualify as dependent on booze. To provide a current estimate of American drinking habits, researchers collected data from the National Survey on Drug Use and Health, which included responses from 138,100 adults around the country. Excessive drinkers included anyone who engaged in binge drinking over the past month (five drinks in one session for men, four for women), any alcohol consumption by pregnant women, or any underage drinking within the past 30 days. 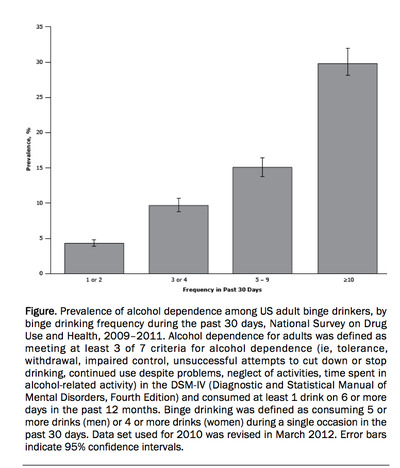 Researchers were surprised to find that even though a good number of people drank too much, only one in ten fit three or more of the seven criteria used to evaluate alcohol dependence: tolerance, withdrawal, impaired control (the inability to stop drinking once you start), unsuccessful attempts to cut down or stop drinking, continued use despite problems, neglect of activities, and time spent in alcohol related activity (having a large portion of your life revolve around drinking). Binge drinking is considered a big risk factor for developing alcohol dependence, but nine out of ten excessive drinkers had a binge drinking session within 3o days of the survey. This was most common among young men (18 to 24), non-Hispanic whites, people with at least some college education, and people who earn more than $US75,000 a year. Among binge drinkers, those who did so more than five times in the past month were more likely than other excessive drinkers to be alcohol dependent. About one-third of people with more than ten binge drinking sessions qualified as dependent. There are some limitations to this information, including the fact that people tend to underreport their drinking and some people may be less likely to self-report dependency criteria. It’s worth noting that not qualifying as dependent doesn’t mean excessive drinking is healthy. Drinking too much is still considered the main factor behind 88,000 deaths a year and an economic cost of $US223.5 billion in 2006, mostly attributed to binge drinking leading to problems including violence, HIV infections, unintended pregnancies, and of course, eventual dependence. The researchers say that this study should help clarify the best type of treatment for anyone with substance abuse problems.